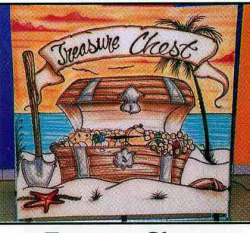 The colorful treasure chest holds the mystery of surprise for the little ones. You fill the bag behind the canvas with small grab bag treasures. Used as a “reward of bounty” the child can reach in to pick a surprise.